I love butter. No matter if it’s cooked into things or slathered onto things. It’s that simple. I just love butter. There is something so satisfying about the smooth luscious texture butter brings to dishes that other fats just can’t mimic. Pastry isn’t the same without butter. Just try and picture a baked potato without butter. Luckily for me, I have some pretty great friends who make sure my food cravings, whims, and loves are well taken care of. Last week, I received an amazing new butter from my friend Matt at Oahu Fresh. It is the Garlic Herb Garden butter from Naked Cow Dairy Farm and Creamery in Waianae, Hawaii. I have been using it on everything! The blend of herbs used is well balanced and flavorful but not overpowering when I use it in recipes. As I have mentioned before, there are a few things I always keep in my kitchen. Butter (of course! ), the basic dry goods for baking, tinned tomatoes and beans for soups or pastas are all well stocked. I also like to keep a variety of foods that keep a while in the fridge. Root vegetables and cheeses both stay fresh for quite a while and make great add ins for recipes when I don’t want to go to the store but still want to make something that will impress a guest. Finally, one of my all time favorite ingredients – puff pastry. This is one of the few items that I purchase premade even though I could make it myself. Franky, the store bought version works perfectly well and the time required to make your own puff pastry pretty much kills the whole point of having it around for a quick easy meal. 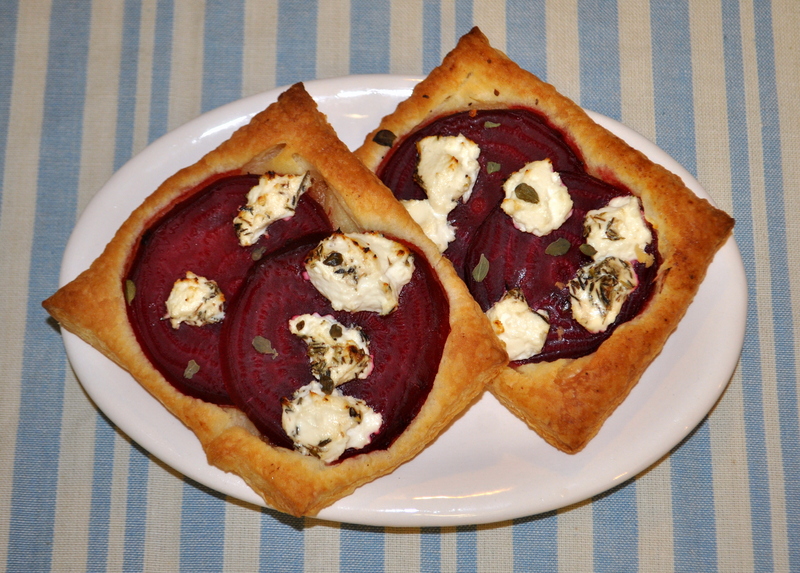 With puff pastry, some beets, goat cheese, an onion or two, and my yummy butter, I tossed together one of those great dishes that looks impressive but is really quite simple. The tarts, a salad partly from my garden and partly from my batch of goodies from Oahu Fresh, and a bottle of wine and my friends and I had a wonderful evening of food and conversation. It really is simple. You don’t have to make the most complicated dishes or use the fanciest things to have a great dinner party. Heck, you don’t even have to plan it out. The best meals are those that bring you joy.